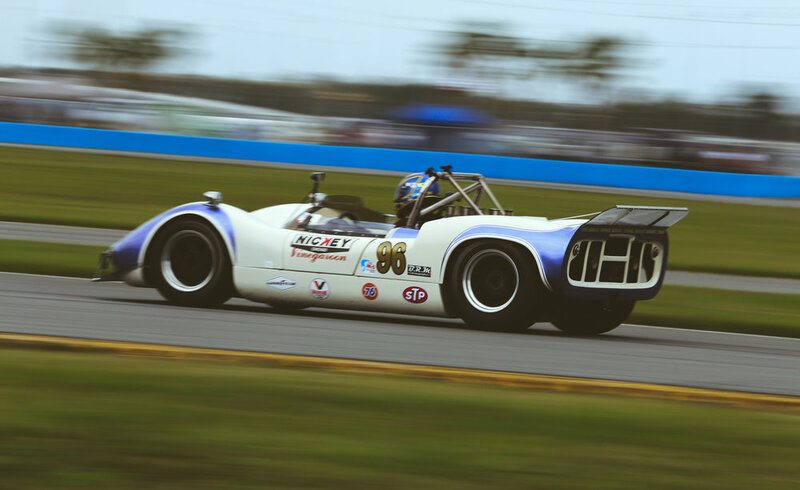 In its third year running, the Daytona Classic has found itself bigger and better than ever. There is no doubt that this event has become a permanent fixture on many a calendar, racer and fan alike. With the list of entrants swelling to 165, and teams hailing from 18 countries, the variety of metal on offer is as vast as the stadium itself. While competitors and crew take on the storied banks of Daytona with utmost resolve, both are more than delighted to field questions from fans. This is where the true beauty of this event lies, it's all-access nature. Fans will find themselves inches from their hero-cars and legends of years gone by. The prospect of tearing around a circuit in an invaluable race car is enough to send most speculators for the hills. So when the rain started falling, most expected the million dollar artifacts to be tucked away with haste. Not these audacious few, most had rain tires ready for just such an occasion. Ready to do battle as they did in the glory-days, no matter Mother Nature's will. 934.5 casually pitting in the rain. While some entrants may leave one wondering how the term "classic" could be applied. Simply, these future classics are ineligible for points or the podium while running with their older counterparts. The term classic may conjure images of parade laps before a major race, this is not that. All of the cars are pushed to the limit. This McLaren M1B was power sliding out of turn-5 lap after lap, Bruce would be proud. This year we were unable to stay for the full 24 hours, but we have in the past and would highly recommend it. Only because the fireballs become more intense. See you at the HSR 12 Hours of Sebring!